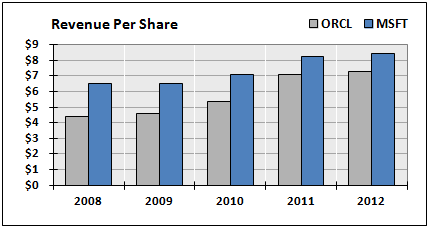 This article presents a financial analysis of Oracle (ORCL), which sold off sharply in the 12.20.11 after-hours session after missing hard on top-line revenue and bottom-line earnings. 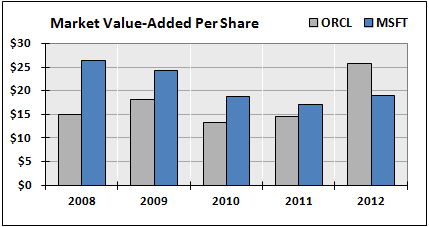 The analysis shows that this recent price correction has compressed ORCL’s stock to fair value based on a discounted free cash flow model and a slow-growth future trajectory for the company. 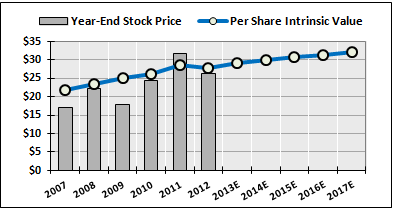 The stock merits a BUY recommendation at its 12.21.11 closing price of $25.77. Technical analysis indicates negative stock price momentum, however, so even more attractive entry points may lie ahead. 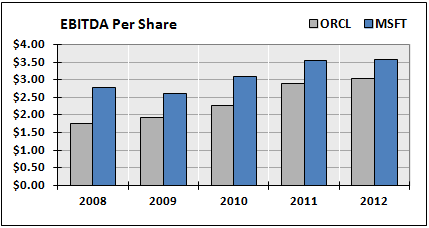 ORCL has strong and growing EBITDA/share and NOPAT/share, generates large free cash flows, earns a return on capital well above its cost of capital, and is well-positioned to create value even if future growth downshifts to a new, slower trajectory. 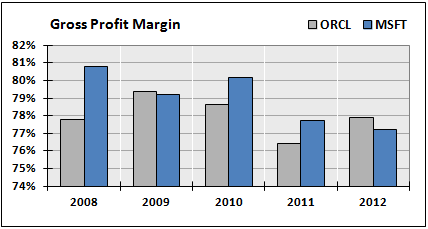 I do not expect ORCL’s stock to languish after this revenue/earnings miss like Cisco or Hewlett-Packard. 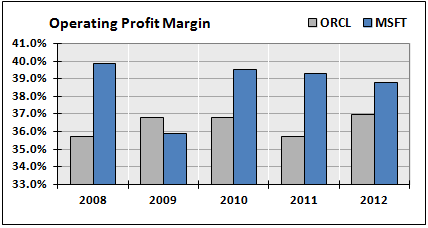 The analysis shows that the company is not broken and can continue creating value in a slow-growth environment. 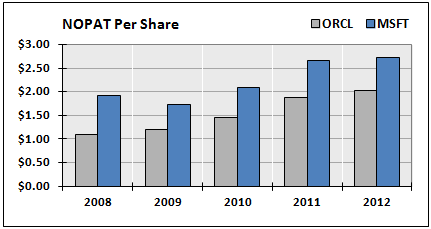 If OCRL follows the MSFT and INTC model, investors will see large dividend increases in the near future, as the company puts more energy into growing dividends to compensate for its slower future growth. 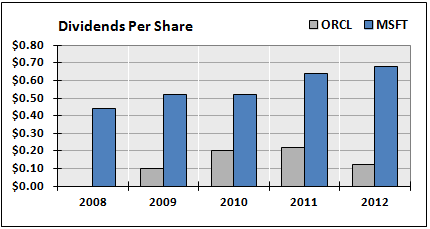 ORCL has a market cap of over $147 billion, posts a return on capital of 15.6% (well above its cost of capital of 9.1%), and had a consensus analysts target price of $36.00 prior to its 12.20.11 price decline. 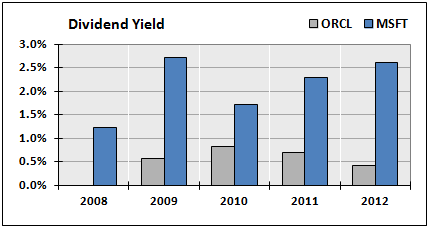 The stock now yields 0.5%, and its trailing P/E has compressed to a reasonable 14.2 times earnings. 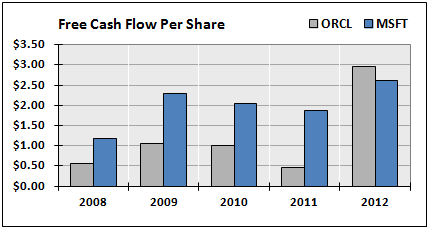 As shown below, ORCL creates large and growing economic value-added, and has large and stable free cash flow margins. 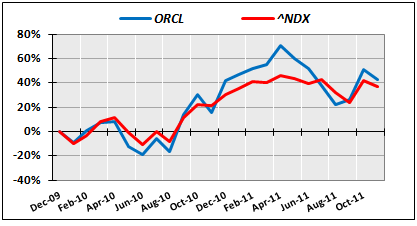 ORCL has a beta of 1.19 vs. the Nasdaq-100 index over the past 36 months, a slightly negative annualized alpha due to its higher volatility, respectable institutional ownership, and is one of the most lightly-shorted stocks in the market. 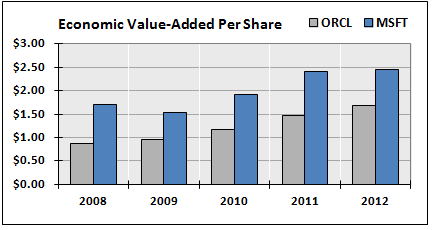 Both companies create large and growing economic value-added per share. 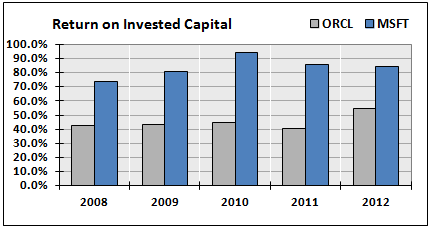 A detailed valuation analysis is shown in the table below. 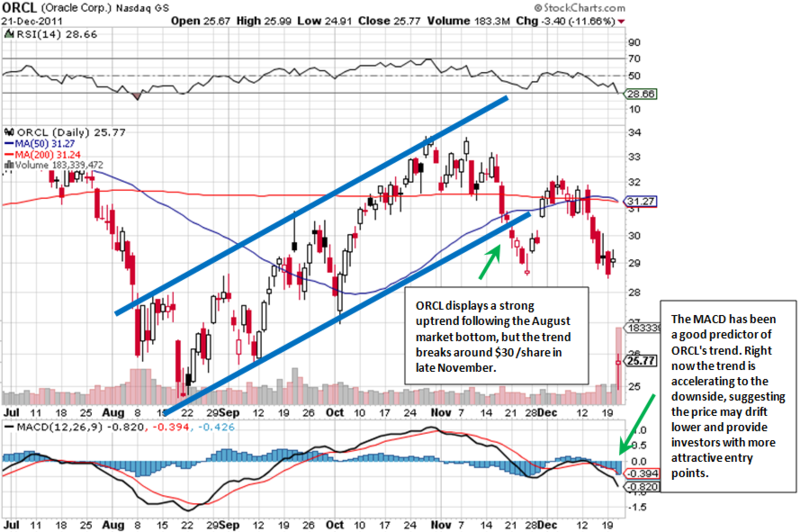 Conclusion: ORCL’s 12.21.11 closing stock price of $25.77 is well-supported by fundamentals and most likely represents a good entry point for the long-term buy-and-hold investor who does NOT require high dividends. Technical analysis indicates negative stock price momentum, however, so even more attractive entry points may lie ahead. 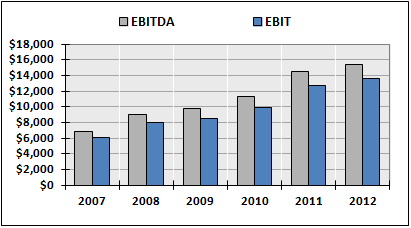 The stock has strong and growing EBITDA/share and NOPAT/share, generates large free cash flows, earns a return on capital well above its cost of capital, and is well-positioned to create value even if future growth downshifts to a new, slower trajectory. 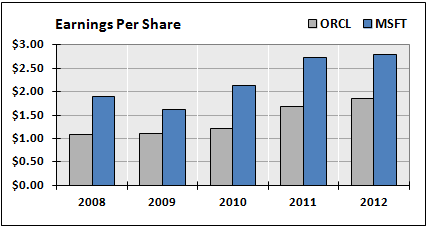 I do not expect ORCL’s stock to languish after this revenue/earnings miss like Cisco or Hewlett-Packard. 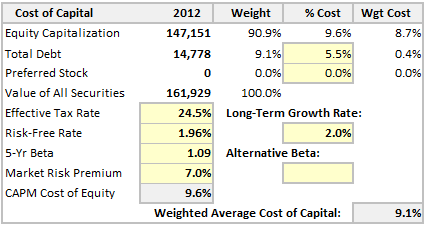 The company is not broken and can continue creating value in a slow-growth environment. 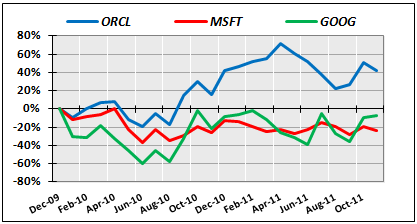 If OCRL follows the MSFT and INTC model, investors will see large dividend increases in the near future, as the company puts more energy into growing dividends to compensate for its slower future growth. 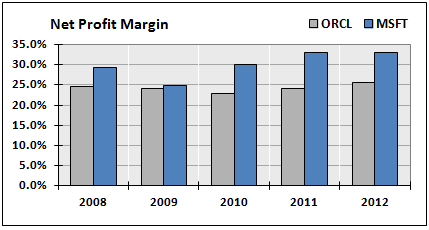 Defensive Stock Sectors Led the Market in 2011 Which S&P 500 Sectors Have the Highest Margins?